A young graduate begins a new chapter in her life after university on the path to achieving her dream of being a policy analyst. Growing up in a remote area and experiencing firsthand the difficulties in accessing basic services is what pushed Martha Waim to excel in her studies right through to university. Martha became the first of her 11 siblings to graduate with a university degree – a coveted Bachelor of Economics from the University of Papua New Guinea (UPNG) at the 62nd Graduation Ceremony on 28 July 2017. It was the proudest moment for this young woman from a mixed parentage of Simbu and Eastern Highlands Provinces which she shared with her extended families from both sides. University graduation ceremonies are perhaps as exciting an event for the families of graduates as they are for students themselves. Martha is now a cadet at the National Research Institute, researching Universal Basic Education. Twenty members of Martha Waim’s family from Simbu and Eastern Highlands certainly weren’t going to miss the occasion. With the airport closed at Mount Hagen, most of her family made their way to Goroka where they were able to secure tickets to Port Moresby. A few missed out though and rushed down the Highlands Highway by four-wheel drive to Lae, where they arrived just in time for the last flight of the day to the nation’s capital. At UPNG, Martha came under the tutelage of Australian National University (ANU) academics who work at the School of Business and Public Policy through the Pacific Leadership and Governance Precinct. The Precinct is a partnership between the Governments of Papua New Guinea and Australia that is supporting the development of future leaders, including those who can shape the nation’s public policy. She said the ANU academics’ passion and commitment had a great influence on the students. “The lecturers put a lot of time and effort in to the program,” Martha said. “They took a personal interest in us, in what our dreams were and what we wanted to do. Martha was one of 57 students who benefited from the UPNG-ANU Partnership throughout their degree program. 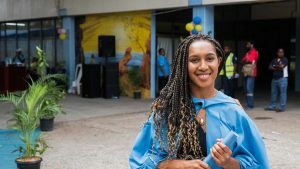 Martha Waim holds her coveted Bachelor of Economics from the University of Papua New Guinea at the 62nd Graduation Ceremony. ANU academics teach hundreds of School of Business and Public Policy students each year and assist with curricula design, capacity development and research agendas. Australian High Commissioner Bruce Davis, in his address at the Graduation Ceremony, said the students could achieve great things by applying their education in a way that benefits Papua New Guinea. “Congratulations to all those graduating today and all those who have supported you on your journeys – your family, friends, lecturers and tutors,” Mr Davis said. “You are now the future leaders of Papua New Guinea. Martha is up for the challenge and her path has led her to a graduate position at the Papua New Guinea National Research Institute (PNG NRI), where she is contributing to the evidence base for the nation’s public policy makers. “PNG NRI has taken me on as a cadet. I’m currently attached to the education program – Universal Basic Education – doing surveys and research. The National Research Institute provides graduate opportunities for emerging leaders, including Martha Waim, Daphney Kollin and Jamie Sali. David Ayres, PNG NRI Senior Deputy Director, said the cadetship brought outstanding recent graduates to the Institute and provides them a year of training and experience. 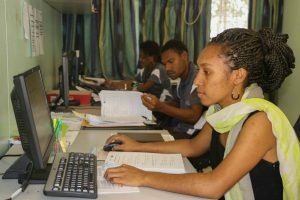 “PNG NRI has for a number of years had in place a cadetship program. In the past couple of years we have given that program a much sharper focus and professional edge,” he said. 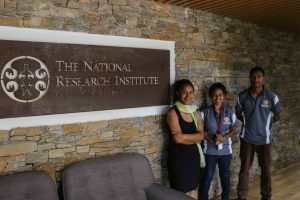 “Those that excel are then provided with the opportunity to join PNG NRI for a further two years as Research Project Officers. At present, we have 6 cadets, and 6 Project Officers working at the Institute. Martha said the undergraduate degree and her cadetship were important steps towards her aim of contributing to Papua New Guinea’s future. “I’m passionate about seeing development in my country – it’s the reason I took up economics,” she said. “I come from a remote area in the Highlands where it is very difficult to access services; I lived there and know firsthand how things are.